We had some new visitors to Phuket in January 2015. My aunt and uncle were in Thailand for the first time, staying 7 nights at the Centara Karon Resort which is a few minutes walk from the sands of Karon beach and a couple of kilometers up the road from my office at Sunrise Divers. We had a couple of evenings with them visiting a few favourite places like Kopitiam and the After Beach Bar, but since it's high season I could only take one full day off that week. On Sunday 11th January I drove to pick them up from the hotel for a little tour around some of the sights in the south of Phuket before heading to the beach in the late afternoon for my son's birthday party. And, as it happens, it was also my aunt's birthday. All photos on this page were taken on the same day. For tours like this or anywhere else in or near Phuket, contact my friends at Easy Day Thailand! This little tour covers a lot of beautiful scenery and is only a small corner of southwest Phuket. It was one of the first parts of Phuket that I explored when not diving. It was a very quiet area then, but even now the roads are not so busy and it's a nice area for a ride on a moped with lots of possible stopping off points. It was nice to be a "tour guide" for half a day and this trip with my relatives helped me remember that Phuket really is a nice place to live! We started from Karon to the south, past Kata beach and then on the hilly, winding road along the coast to Naiharn beach. 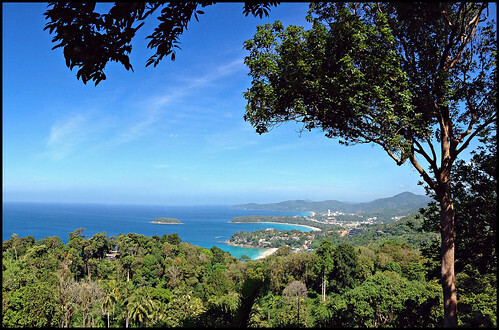 First stop was the well known Karon Viewpoint (also called "the Phuket Viewpoint" or Kata Viewpoint). And as you can see the weather was perfect, just what you'd hope for in January. Always a great view from here looking north along the Phuket coastline. There are many great coastal views in Phuket. From the viewpoint you drop down towards Naiharn. This area has got so much more developed in the last 10 years, lots of restaurants, houses, a few resorts, and there are banks and local businesses. When the road gets to Naiharn Lagoon, there is an option to turn right and stop at Naiharn Beach, maybe visit Naiharn temple or follow the coast round to the very small Ao Sane beach. But we headed on south. The road here is narrow and hilly. You climb from beach level up to about 50 meters above sea level where there's a wind turbine, a great view and not a lot of parking space! This is one of my favourite views in Phuket. Just a few minutes drive from Ya Nui is Phromthep Cape, which is the "end of Phuket", the most south-westerly point on the island and a very popular stop for sunset views. I actually think there are better places for a sunset, but that's another story! Certainly the views are lovely. I was disappointed this time, because the lighthouse was closed (normally you can climb up for a better view). A hike to the very end of the cape was not an option with a couple of "not so young" folks, but I do recommend it. I did consider lunch at the Cape Phromthep restaurant. We have eaten there only once before and I do want to try it again sometime, but preferably at sunset. On this occasion, I thought we could try a place at Rawai beach, just another 5 minute drive. Rawai beach is changing too - more modern looking buildings on the beach road and a resort under construction. I chose a place called Rimlay for lunch towards the jetty end of Rawai beach (east end), next door to the well known Nikita's restaurant. 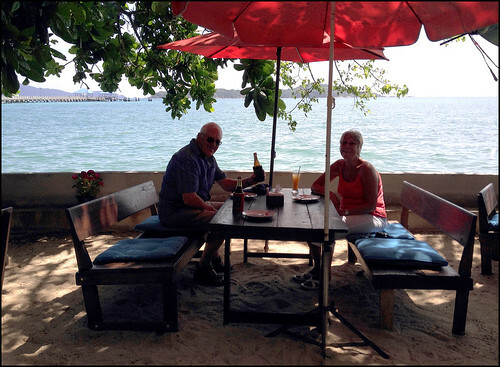 Rimlay has some tables in the shade right by the sea, looked ideal and I'd say my aunt and uncle thought so too! I had a great seafood salad and (of course) a cold Chang. We sat by the sea and I thought "damn, Phuket is a great place!". Rimlay is certainly one to visit again. A very pleasant lunch. Time ticked by, a second cold beer was enjoyed and it was time to move on. We could have stopped at the Phuket Seashell Museum, but time was limited. We drove to Chalong and then up and up the hill to the Big Buddha. It was rather busy up there. My aunt had to borrow a sarong to cover her shoulders (they hand these out for free at the entrance). You are supposed to dress properly at temples. I saw a shirtless guy being stopped by "Big Buddha Security" and not allowed in without a shirt. The day continued to be hot with blue skies. 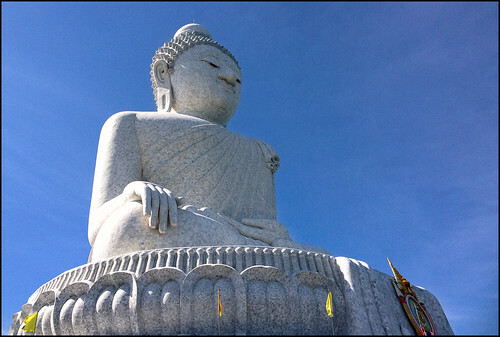 From the Big Buddha, given a little more time, a stop at Wat Chalong Temple would have been next on the list and between there and home there's also the Phuket Botanic Garden and the Bird Park. A bit too much for a day! We had a party to get to, and so the Big Buddha was the last stop on this trip. We stopped home to pick up the family, headed off for the party and the day ended like this ... Perfect. This kind of tour is something I often suggest to people. This corner of Phuket has a lot to see, and the scenery is beautiful, plus there are loads of options for restaurants and bars - if you did this as an afternoon tour it would finish nicely with a sunset at a viewpoint or the After Beach Bar. 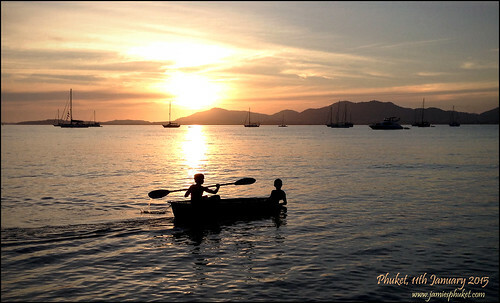 It's a very nice part of Phuket away from the busier beaches, lots of places of interest, sea views and small beaches. Especially ideal if you have a hotel around Karon beach or Kata beach. It had been a while since I'd done a little tour like this and even for me, living here a long time, it was a lovely day! For guided tours like this or around any area in or near Phuket, contact my friends at Easy Day Thailand!